Most working women in Butte engaged in “commercialized domesticity.” Miners, carpenters, blacksmiths, pipefitters, and men who worked in scores of other occupations dominated the mining city. Until well into the twentieth century the majority of them were single. They needed to be fed, clothed, nursed, entertained, and generally looked after by women who performed domestic tasks for wages. 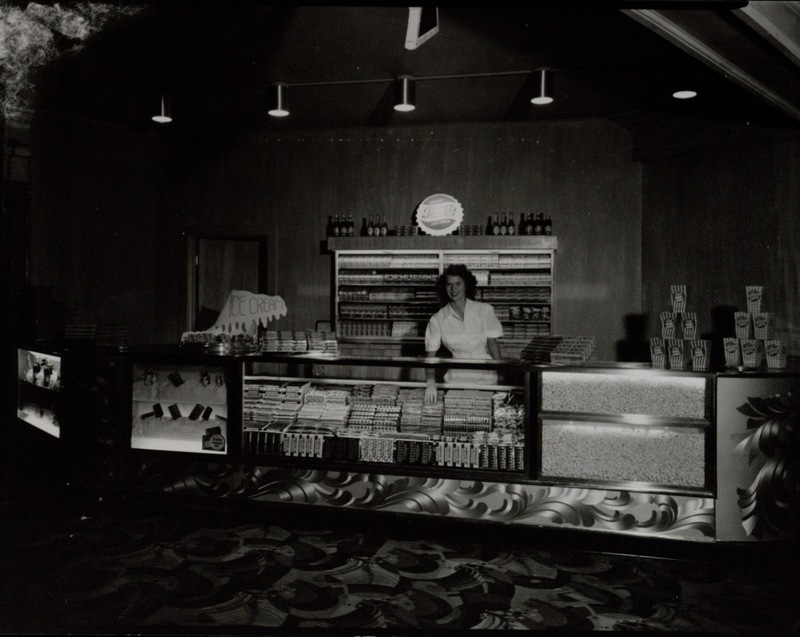 Working men ate in cafes and boardinghouses, slept in rooming houses, sent their laundry out, and spent their evenings in saloons, dance halls, and theaters—except for the saloons, these were all places where women worked. Women’s work made men’s work possible. Most working men in Butte were members of labor unions. In fact, the extensive nature of union membership had earned Butte the nickname, “the Gibraltar of Unionism.” The Women’s Protective Union offered female workers a similar kind of organization and solidarity. The WPU eventually encompassed all female restaurant workers and a variety of hotel and motel maids, public building janitresses, hospital maids, girls who sold candy and popcorn in movie theaters, carhops at drive-ins, cocktail waitresses, and women employed at the local tamale factory. Best known of the early union’s members were the “bucket girls” who worked in boardinghouses and cafes, each day packing thousands of lunch buckets for three shifts of hard-rock miners. The WPU reached its peak membership of 1,149 in 1955. The Women’s Protective Union had a rich history of association with labor movements across the western United States. In 1903 it affiliated with the American Labor Union, an organization chiefly representing western miners. The WPU submitted to the ALU the proposal that female organizations be taxed at one-half the rate of male unions owing to the lesser wages paid to women. In 1905, after entertaining a variety of speakers from the nascent Industrial Workers of the World, the WPU voted to join that radical labor group. On July 9, 1909, the WPU received a charter from the Hotel and Restaurant Employees International Union, but still retained its distinctive local name. For the following sixty-four years, the union remained an exclusively female organization. Val Webster began working as a dishwasher when she was sixteen years old. A year later she became a waitress and then a cook. Right from the beginning, she was a member of the WPU and eventually served for sixteen years as the union’s business agent. As did many members, Val found not only job protection, but friendship within the union. She remembered loving to attend union meetings and listening to the business agent and secretary talk about how they negotiated with and admonished bosses who sought to take advantage of members. After the meetings, she and friends would go out for ice cream. 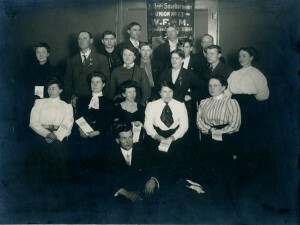 Members of the WPU and Silver Bow Trades and Labor Council posed for this photograph circa 1900. PH088 W.P.U./H.E.R.E. Photograph Collection, Butte-Silver Bow Public Archives. The WPU was extremely successful in protecting its members. By 1945 women worked eight-hour shifts, six days a week. They had overtime pay, sick leave, and paid vacation. Few service workers in America enjoyed such benefits. However, like many labor associations that emerged in the nineteenth and early twentieth centuries, the WPU had a wider agenda than increasing wages and protecting job rules. It held classes in job skills for its members, as well as classes in personal hygiene, childcare, and citizenship. Throughout its history the WPU supported progressive political and economic causes: national health insurance, unemployment insurance, a national retirement system. It also helped raise money for local improvements, like the municipal swimming pool, and, of course, supported fellow trade union members when they were organizing and striking. In turn, the WPU expected and received support from male unions. In 1949, when the WPU went on strike for higher wages, Blanche Averett Copenhaver, the picket captain, recalled that “Everybody honored the picket lines. Teamsters wouldn’t deliver, building trades wouldn’t do any work.” The women got support from the bartenders, cooks, and waiters. Eventually the WPU wrested a raise for its members. One of the most significant successes of the WPU occurred in the 1970s when they were able to unionize the workers of fast-food franchises that had moved into Butte, franchises that were not unionized elsewhere in the state. In 1973 the female-only Women’s Protective Union disappeared. The international union instructed the WPU to merge with the Cooks and Waiters Union, Local 22. After some resistance, the WPU complied, and the two unions formed the Culinary and Miscellaneous Workers Union, Local 457. Women’s Protective Union, No. 457. (Butte) Montana records, 1901-1974. MC 174.Montana Historical Society Archives, Helena. Ross, Marilyn Maney, and Janet L. Finn. “Sisterhood Is Powerful: The Labors of the Butte Women’s Protective Union.” In Motherlode: Legacies of Women’s Lives and Labors in Butte, Montana, ed. Janet L. Finn and Ellen Crain. Livingston, Mont. : Clark City Press, 2005. Weatherly, Laura Ryan, and Margaret Harrington. “Bucket Girl, Yard Girl, the Women Who Worked in Butte.” Catering Industry Employee (October 1975), 22-23. Webster, Valentine C. Interview by Mary Murphy, February 24, 1980. University of Montana Oral History Collection, Missoula. Women’s Protective Union/Hotel and Restaurant Employees and Bartenders International Union Records, 1901-73. Montana Historical Society Archives, Helena.